The first edition of Secretary's week was held in 1952 in response to a shortage of skilled professionals in the workplace, and was sponsored by the National Secretaries Association. Since then technology has taken it's toll on the workplace and a secretary's task list has expanded drastically. Secretaries have come to be more commonly called Administrative Professionals, but recently a new trend has emerged, or rather an old trend has reemerged. The International Association of Administrative Professionals published a press release stating that in the last four years, "Administrative Secretary" has become increasingly popular as a job title. No one knows why the old title is gaining popularity but IAAP suggests that the popular Mad Men TV show set in a 1960s era Manhattan office has something to do with it. This year's edition of what is now called Administrative Professionals Week is coming up (April 23rd to April 27th 2012), and nostalgic renaming aside, secretaries or administrative professionals have always been the backbone of offices and companies around the world. In truth, we aren't sure how far their bosses would get without them! It's time to show recognition. 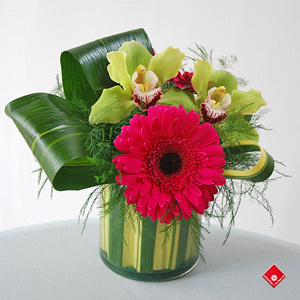 The Flower Pot has specially designed an artistic arrangement of cymbidium orchids with gerberas in a colorful cup that is sure to make your assistant smile. For a thoughtful gesture, send this arrangement on Friday, April 27th 2012 so that he/she can bring the gift home for the weekend. Giving one of The Flower Pot's European water bouquets is also a perfect way to offer long lasting beauty that is easy to care for. The fresh flower bouquet will brighten your assistant's desk up to 30% longer with this convenient technique. Just as your assistant supports you in many ways, there are many ways to show your appreciation for all the hard work that is done for you. Visit our website, stop by our store(1340 Notre Dame Ouest, Montreal), or call us (514-938-1234) so we can help you choose something special. The options are endless! Is there Black roses available?